Back to Dumbo. This Dumbo theme wasn’t too difficult to figure out! [Dumbo = elephant = peanuts] + [Dumbo = elephant = Circus = popcorn] = Peanut Butter Popcorn! o/ Needless to say the next equation is Peanut Butter Popcorn = Lots of delicious sweet and salty popcorn in MAH BELLYYYYY!!! Dumbo is a movie from 1941 about this little guy (elephant…) called Dumbo (actually, his name is Jumbo Junior, but the mean gossipy elephants started calling him Dumbo because of his big ears) that is picked on throughout the whole movie, loses his mother and is made a clown in the Circus, until he discovers he can fly (thanks to his mouse friend! ), surprising everyone and becoming a big star! The movie is set in a traveling circus in the United States (they show a map of Florida in the beginning). One thing I find very weird about this movie is that whole sequence when Dumbo (a child!!) and his mouse friend get drunk (!) and hallucinate for over 2 minutes with psychedelic pink elephants dancing and singing… I’m sure there might be lots and lots of studies on this all over the internet. 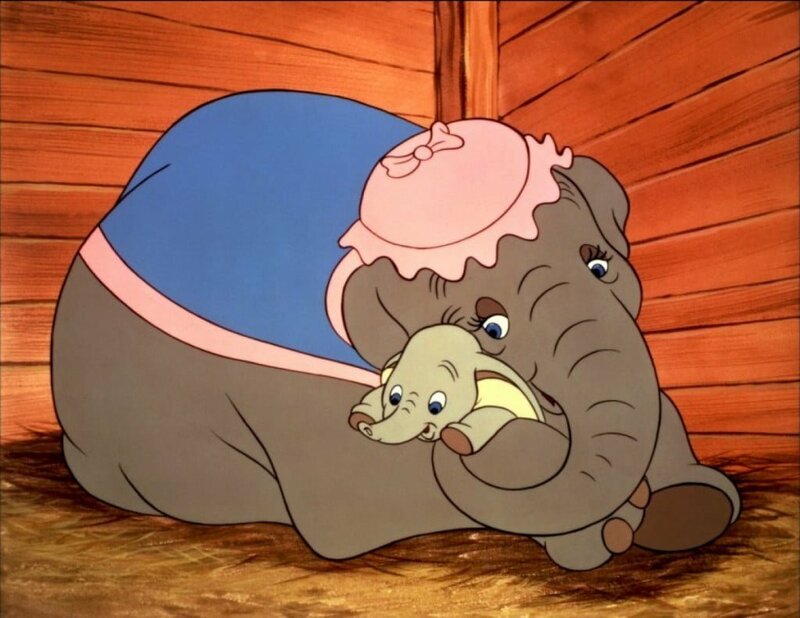 I just wanted to point out that Disney used to be way more liberal in the past, when baby Dumbo would get drunk, Alice would eat suspicious mushrooms, Snow White lived with 7 little men…! Nowadays it’s all politically correct and safe. Not that I’m complaining, but I do love the Classics! In a small sauce pan, over medium heat, simmer the honey and the sugar until the sugar is dissolved. Add the peanut butter and the vanilla extract. Stir until the peanut butter is dissolved and you have a creamy sauce. 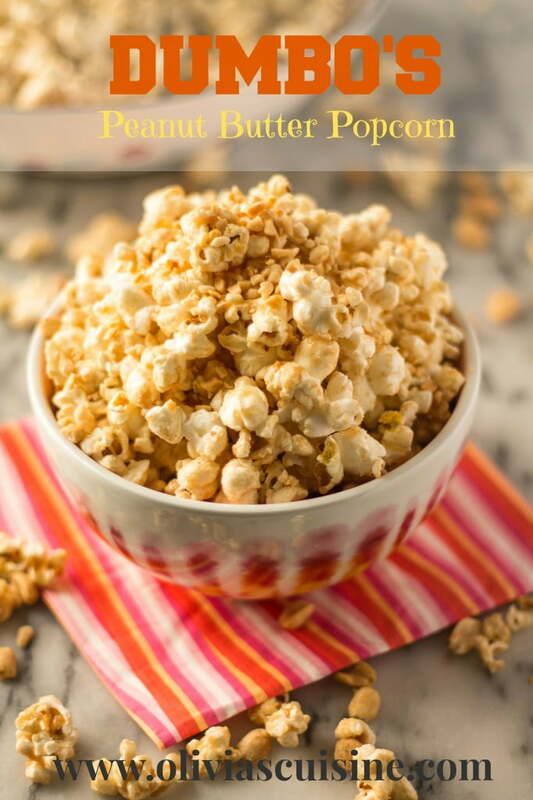 In a big bowl, pour the peanut butter sauce over the popcorn and mix it well so all the popcorn is coated. 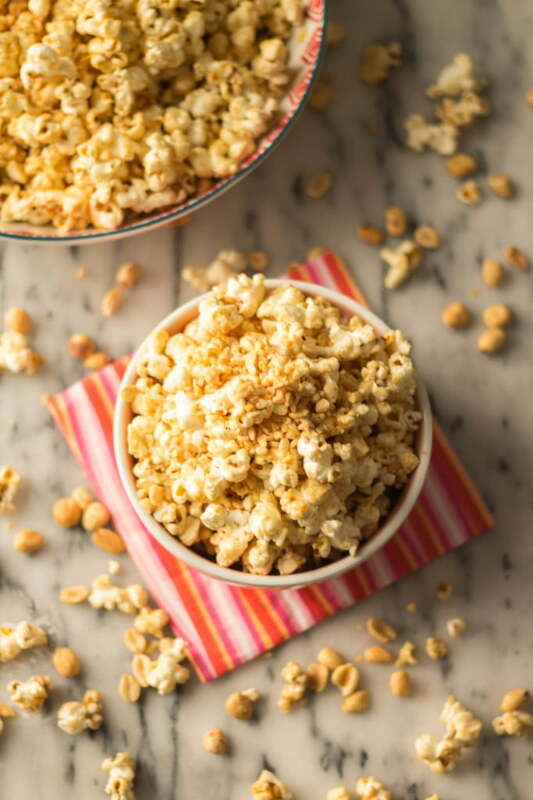 Add the chopped peanuts and give it another mix so the peanuts stick to the coated popcorn. 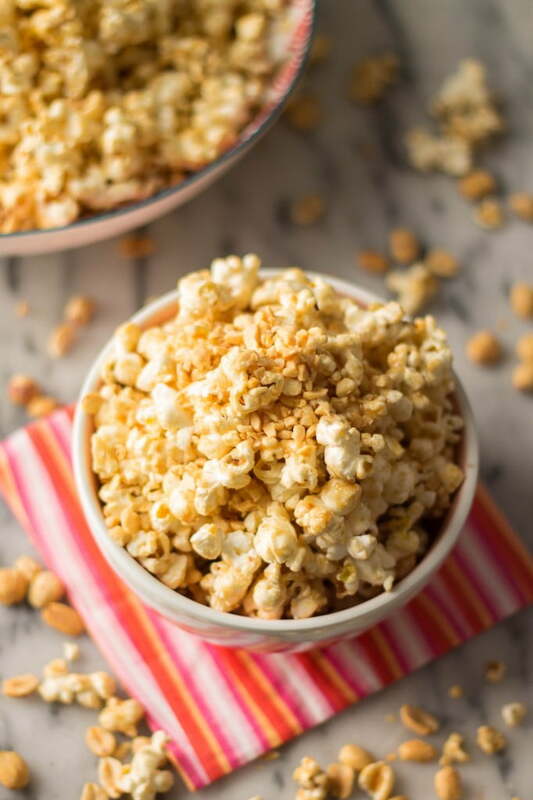 Spread the popcorn on a large baking sheet lined with parchment paper. Sprinkle some sea salt all over the popcorn. Let dry for 10 minutes before serving. Yep, I cry at Dumbo every time! What a fun series! I’m so glad I found your blog. This popcorn looks delicious. Thank you for sharing! Adding you to my feedly! ooh i am definitely craving popcorn right now, can’t remember the last time that i had some! 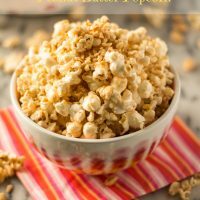 WOW this popcorn recipe looks AWESOME, girl!!! My husband is crazy for popcorn and peanut butter. So, I’ve gotta make this for him! Love it! Thank you, Olivia! :) Make some for him and then let me know what you think!! !